Amphibians are a key indicator species of ecosystem health. 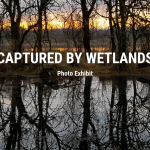 Their presence or absence can tell us a lot about the general health of a wetland or riparian area in addition to giving us a sense of site water and habitat quality. When climatic and hydrologic changes occur in an ecosystem, amphibians are often the first to react. Their thin skin makes them vulnerable to temperature increases, chemical pollutants, disease, and radiation. The combinations of pollutants, habitat fragmentation and development in urban areas have had a negative impact on amphibian populations. In the Portland Metro area, everything from mutations of extra legs to complete absence of native amphibians has been documented.